Comedians have been making their way to Broadway recently, with Robin Williams in Bengal Tiger At The Baghdad Zoo and Dane Cook in Fat Pig this season. Even Saturday Night Live alumni like Will Ferrell and Chris Rock have made their debuts—Rock in this season’s The Motherf**ker With The Hat. Soon, another SNL name could be seen on a Broadway marquee, but as the play’s subject rather than as a cast member—the late Chris Farley. 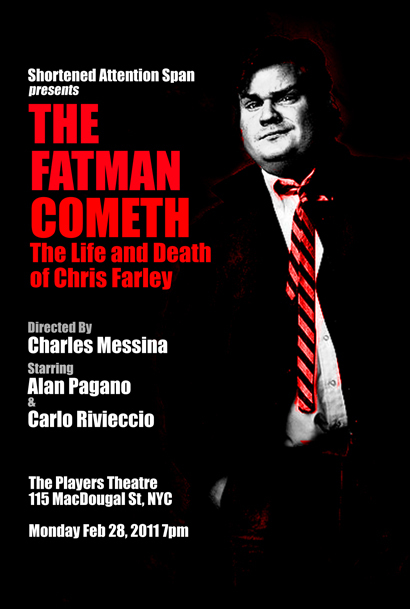 A reading of the new play The Fatman Cometh: The Life and Death of Chris Farley held an industry reading on February 28 at The Players Theatre. The play, which is a work in progress, depicts conversations between Farley and his manager in his dressing room at SNL during his final months as a cast member. The play, which ran approximately for an hour, needs to be fleshed out, but there is potential to find an audience among nostalgic comedy fans and fervent Farley followers. The play is funny, which is a necessary factor, given Farley’s outrageous humor. Alan Pagano’s portrayal of Farley is a physically accurate performance without being a full-out imitation. The script is peppered with real accounts of Farley’s pranks and public buffoonery (such as sticking his naked behind out of a car window), references to SNL stars Adam Sandler, Chris Rock, David Spade and John Belushi, and Farley’s cult films. The character of Farley’s fictional manager Kip Kaplan gets lots of punch lines, as he brushes his client off with stereotypical Hollywood cynicism. Where Fatman Cometh shows true potential though is in its drama. While not laying it on thick, the play caters to an audience attracted to the legacy of legendary comedians and points to the theme that with so many successful performers, there were often tears behind the laughter. Writer and director Charles Messina paints Farley as a man who was desperate to better the world with laughter, just so long as they weren’t laughing at him. Farley expresses to his manager his ambitions to break into more dramatic film roles, including a biopic of Fatty Arbuckle, a silent film star of early Hollywood. However, his manager demeans his greater ambitions, telling Farley he will always be the guy audiences pay to see fall on his face. He also enables Farley with the drug habit that eventually killed him in 1997. Kaplan represents the “I can’t” that Farley faced in his lifetime, and that element should be embodied in more characters as this work progresses. Interesting elements of Farley’s character that need to be developed, but show a greater depth that should entice potential audiences, are his complicated reverence of his father and intense religious roots. Numerous times during the play, Farley kneels in his dressing room, reciting a comedy prayer to God. It will be interesting to see what kind of a future is in store for The Fatman Cometh. Being that pop culture establishments are such a Broadway hook, a play about a beloved comedian and his still-living famous friends could find a welcome audience on a New York stage. Do you think The Fatman Cometh can find an audience, Rushers? Does this play sound more Broadway or off Broadway to you? Are you a fan of Chris Farley’s? Would want to see his life portrayed on stage? Leave your thoughts in the comments below! I definitely see this as an off-broadway play to create a more intimate setting for those select loyal fans who want to learn more about Chris’ true character. An expansive set with bells and whistles isn’t neccessary to uncover the actor’s thoughts and emotions. To hear his words and not his jokes will be a welcome change of pace. Rotating some cameo appearances by SNL members and friends would add another dimesion and more time to the show and give it the potential to attract larger audiences.